The D.C. Council approved the city's minimum wage increase in a final vote Tuesday, with hourly pay set to rise to $11.50 by 2016. With the council already having approved the minimum wage hike unanimously, Tuesday's vote was considered little more than a formality. Under the bill, the District's minimum wage will rise to $9.50 next summer; $10.50 in 2015, and $11.50 in 2016. The bill will go to Democratic Mayor Vincent Gray for his signature. Gray has advocated for an immediate minimum wage hike to $10 an hour, but wants to study the prospect of further increases. The council and the mayor clashed earlier this year over raising wages for workers at Walmart and other major retailers (those with stores of at least 75,000 square feet, and whose parent companies have sales of more than $1 billion annually). The Large Retailer Accountability Act -- known colloquially as the "Walmart Bill" -- would have required those stores to pay its employees a minimum of $12.50 an hour. Gray vetoed that bill in September, after Walmart threatened to pull out of three planned stores in the district. Groups that have protested Walmart, including "Making Change at Walmart," have said the average hourly wage for the retail giant's sales associates is $8.81 an hour, a number based on a study done by research group IBISWorld. However, Walmart said in response that it pays its full-time workers an average of $12.81 per hour. 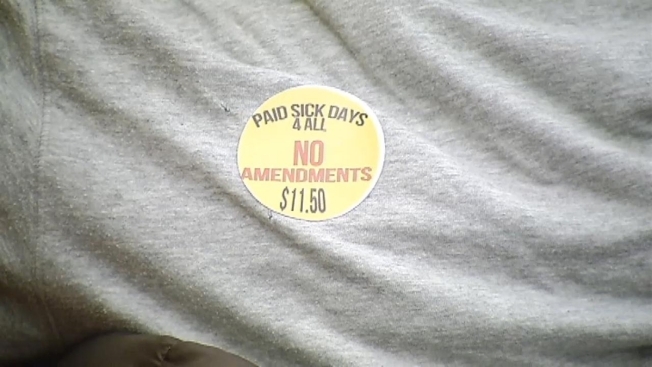 The new minimum wage bill, which would apply to all businesses, large and small, already has enough support to override a potential mayoral veto. Supporters say raising the minimum wage will allow low-wage workers to benefit from the city's prosperity, while opponents worry it will hurt the job market and the district's regional competitiveness. Lawmakers in Montgomery and Prince George's counties have approved similar minimum wage increases in those jurisdictions. Prince George's County Executive Rushern Baker will sign the county's minimum wage bill Tuesday, raising the county's wage to $11.50 per hour by 2017. A similar increase was signed into law earlier this month by Montgomery County Executive Ike Leggett. The District of Columbia's current minimum wage is $8.25. That's $1 higher than the federal minimum.